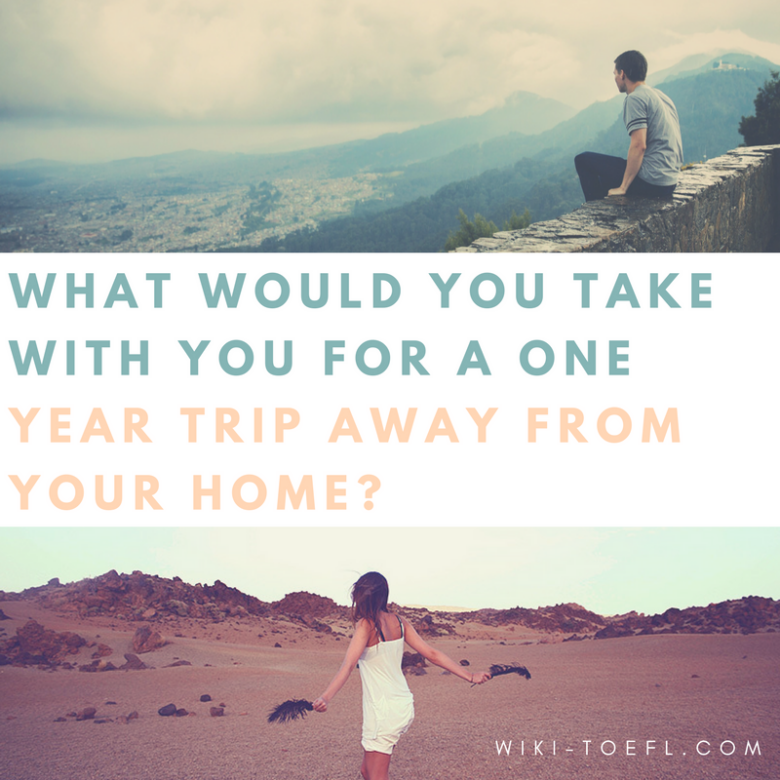 What would you take with you for a one year trip away from your home? Home Writing	What would you take with you for a one year trip away from your home? Imagine that you are preparing for a trip. You plan to be away from your home for a year. In addition to clothing and personal care items, you can take one additional thing. What would you take and why? Do you agree that borrowing money from friends can hurt your friendship? Toefl writing topic: Why is music important to many people? Are reading and writing skills are more important today? Why or why not? Do athletes and entertainers deserve the salaries they receive? If I were to leave my home for a year, there is one thing I definitely would take with me: my cell phone. With my cell phone, I could call my friends or family if I ever was lonely, needed advice, or just wanted to talk. If I were away from home for a year, I would be very lonely, especially in the beginning before I made friends. If I could call my mother and father, I would hear their familiar voices and I would not feel so lonely. Hearing my friends’ voices would also help me overcome my sadness. I’ve never been on my own so there are many things I am not familiar with. I’ve never opened a bank account, got a driver’s license, or made my own food. If I had to cook chicken or something, I could call up my mother and she could tell me how to make dinner. Sometimes, I may just want to talk in my own language. With my cell phone, I could call my friends and tell them about my new life. This would make them jealous of me. I would call them a lot so they could hear all the wonderful things I am doing. For me a cell phone is a necessity. I would need it anytime I was lonely, anytime I needed to do something I didn’t know how to do, and anytime I just wanted to talk. Of course, the phone bill will be sent to my parents. How can schools help new coming students with their problems?